When your family gets together for the holidays, your time is supposed to be filled with happiness and laughter, but what happens when your aging loved one no longer feels the magic of Christmas? 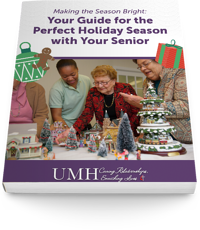 As a holiday gift to you, we've created a FREE guide to making your loved ones holidays bright again. From all of our residents, staff, family members, and volunteers - Merry Christmas and Happy Holidays and best wishes for a blessed New Year!